Ghyll scrambling. Making the best possible use of the local terrain, this activity transforms a ghyll – the local term for a mountain gully – into an adventure playground for a day. A day spent ghyll scrambling will test your muscles and agility to the limit, as it involves first climbing the course of a mountain stream any way you can before heading straight back down again – choosing the quickest, wildest and wettest route possible. The ascent involves clambering over rocks, leaping waterfalls and squeezing through chasms, while the ghyll becomes a fantastic natural waterslide for the descent, culminating with a dramatic plunge into a pool. Enjoy this adrenalin-fuelled activity with a licensed ghyll scrambling group, who will take you to the best courses as well as issuing you with your helmet and protective clothing. Hill Walking. It would be completely remiss not to mention that the Lake District is a hill walkers’ heaven, with some of the most beautiful and breath-taking landscapes in the UK, all with a unique character – and highly accessible too, with routes suitable for all ages and abilities. From the more gentle routes around the Lakes, to the more challenging rugged fells and gorges of the Lakeland area, you will not be disappointed – and anyone who wishes to call themselves a seasoned walker needs to have climbed Scafell Pike and Helvellyn. Afterwards, why not treat yourself after a gruelling day on the hills by returning to one of the best hotels in the Lake District to soothe those aching feet? Sailing. If you’re an old hand, then you’ll know you’ve come to the right place. If you’ve never tried your hand at sailing before, then there is no better place to start than Coniston Water, Ullswater or Windermere. With plenty of wind, but no pesky tides or currents, the Lakes offer amazing opportunities for sailing in beautiful surroundings. Haggerstone Island, Queensland. The opposite of bustling Bondi, the pristine white beaches of this private island are the perfect tropical getaway, Robinson Crusoe style. Best of all, it’s situated right on the Great Barrier Reef! Cottesloe beach, Perth, Western Australia. The locals love it and so will you. Lie on the sparkling white sands, swim in the sapphire-blue seas, or try your hand at a spot of snorkelling or surfing. Join the townsfolk for a ‘Sunday Session’ in one of the unspoilt pubs – a fine local tradition. Manly Beach, Sydney, New South Wales. This place is built for fun, and is only a short ferry ride away from Sydney itself. The beach is always buzzing, with surf shacks, fish & chip cafes and ice creams available at every turn along the palm-tree lined Corso. Cable Beach, Broome, Western Australia. On the edge of the Indian Ocean, you’ve 22km of sands to enjoy here. This makes it ideal turf for the unforgettable sunset camel rides! Coral Bay, Coral Coast, Western Australia. If you can’t face the two hour boat ride to the Great Barrier Reef, then this 10-minute jaunt to the beautiful Ningaloo Reef is perfect. As well as turquoise seas, the bay teems with marine life including manta rays, humpback whales and sea turtles. Bells Beach, Torquay, Victoria. If you’re taking Australia holidays over Easter weekend and love surfing, then head this way for the world’s longest-running surf contest – Rip Curl Pro. Throughout the rest of the year this beach is a Mecca for surfers, and you’ll soon see why. The Gold Coast, Queensland. Is this cheating? The Gold Coast actually features more than 20 beaches, but they are all perfect in their own special way. For guaranteed sun and fun, the Gold Coast is hard to beat. Wineglass Bay, Tasmania. This beach manages to be both popular and unspoilt, thanks to its secluded location behind Freycinet National Park, inaccessible by road. If you want to avoid crowds, shops and city bustle, then this arc of gleaming sand is for you. Byron Bay, New South Wales. Come to this small town for the beautiful sunlit coves and stay for the bohemian atmosphere, with plenty of live music and beach bars. This is the place where Australia’s celebs go to unwind. Since we will be starting our round-the-world adventure next week and every upcoming photo of the week will be of someplace far from home, I thought I would post one last photo of our lives here in Oregon. Our daughter Sydney loves horses and has been taking riding lessons for the past year. 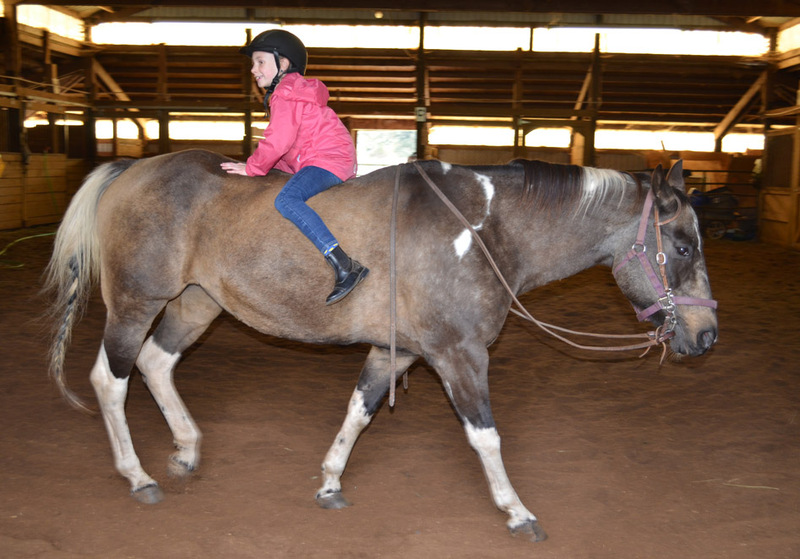 At her lesson, this past weekend, her riding instructor thought she would have a little fun and let Sydney ride backwards. It was pretty funny! Before we leave on our two-year round the world trip, we have been blessed with getting together with friends and family to say goodbye. Typically this entails good food, good company, and good conversation. Food can always make any get together more interesting and pleasurable. This is also one of the things that I am most excited about traveling is trying new foods. So before we leave, I thought I might share some of my favorite breakfast restaurants in Portland. I was hoping to list 5, but could not think of a 5th restaurant worth recommending. If anyone has other suggestions, feel free to mention it in the comments section below. Genies Café is located at SE Division Street and 11th. The breakfast is good and the prices are fair, but what really makes this breakfast place phenomenal is the Bloody Marys. Genies Café has a bacon Bloody Mary that comes with an assortment of hot peppers, and instead of the traditional stalk of celery, it comes with a cooked strip of bacon. This is by far the best Bloody Mary I have ever had. On the weekend, the wait can be long but is much more enjoyable with a bacon Bloody Mary. And for those of you that are vegetarian or don’t eat pork, the regular Bloody Mary is also outstanding. The waiting area is comfortable and has bit of a bar type of atmosphere, which is probably the reason everyone is drinking a Bloody Mary at 9 in the morning. There is also plenty of unique art on the walls and on the wait staff to enjoy. It seems that having lots of tattoos is a requirement to work at Genies. Genies Café also stocks Aardvark Hot Sauce, which my husband swears is the best. Bertie Lou’s is also located in Sellwood. Jason always judges a breakfast place by the eggs benedict they serve up. Bertie Lou’s offers multiple renditions of the eggs benedict from the basic to the ranch biscuit benedict. But even the basic eggs benedict is delicious as it is served on a croissant. While selecting what you would like, you can have a good laugh just reading the menu. Bertie Lou’s is tiny, has good atmosphere, and is a good place for breakfast. Come early on the weekend or expect to wait. One trick I saw was people ordering at the counter and then taking their food over to the bar across the street to eat. Le Petit Provence has several locations, however, the one location in Portland closest to us is located on SE Division and 48th. We recently had the pleasure of being introduced to this wonderful restaurant by family and it now ranks as my favorite place for breakfast. This is the essential French Patisserie. The food is heavenly and the portions are generous, and will not break the bank. The eggs benedicts are excellent, and highly recommended, and the hot chocolate is out of this world. I do not think I have ever tasted such rich and creamy hot chocolate before. Le Petit Provence is also a French bakery and offers baguettes, pastries, and other treats to take home. This past weekend we took a family hike in a forest preserve south of Portland, Oregon. Being Fall, the leaves have started to change color and Sydney found a leaf that she really liked and wanted to pose with for a photo.